We are more or less done with what we planned to do to our guest bathroom so I thought it was high time for some bathroom pictures! Ultimately, we would love to do a complete overhaul but it was definitely not in the budget for phase 1 of house updates. Since most of the tile and fixtures were white, we figured we can live with it a little while longer. 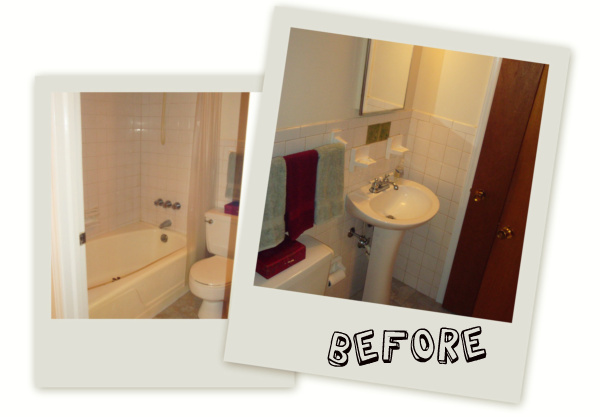 The main issues were the doors, the walls and the nasty yellowed grout. All things we were able to fix! Oh yeah and some stick-on green, vinyl tile decals with butterflies on them….. I had never used a grout pen before. It’s basically like white out for your grout. AND IT’S AMAZING. I actually need to finish a few spots in the shower, but since they are conveniently hidden by the shower curtain, it has fallen down the list of needs. We decided to work from the colors in a print we got on our honeymoon. Since there are no windows, we didn’t want to go too dark. Thankfully, the white accents helped out in the lightness department and we have ourselves a bathroom! Other quick fixes included switching from brass to brushed nickel doorknobs, adding a new light fixture and vanity mirror, painting the walls and doors. 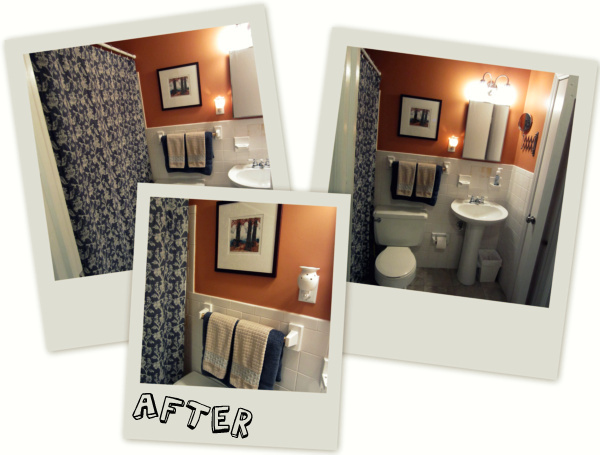 ***pssst….we also gave our half-bath a makeover. Check it out! So pretty! And I am THRILLED to learn about the grout pen. I had no idea! We have some disgusting grout, too. Love it! Totally changed the whole room! I need a DIY lesson in the grout pen. I SO need to do that but real grout scares me. Looks fantastic! You did a great job! What sort of grout pen did you use & where did you get it? I just got “Grout Bully” – my first infomercial purchase ever – and it seems to work well, but I wonder what other options are out there. We have tile floors throughout much of our house and with 2 kids and 2 dogs the grout isn’t looking too hot. Thanks so much! I added the link to the pen at Lowe’s above. It took about 2 full pens to do that small bathroom, so I don’t know how it would work on floors. But there is about a half-aisle dedicated to grout there so I am sure you can find something. Good luck!